Former Mizoram Chief Minister and Congress leader Lal Thanhawla on Tuesday was seen holding a banner with the message, “Hello Independent Republic of Mizoram”. 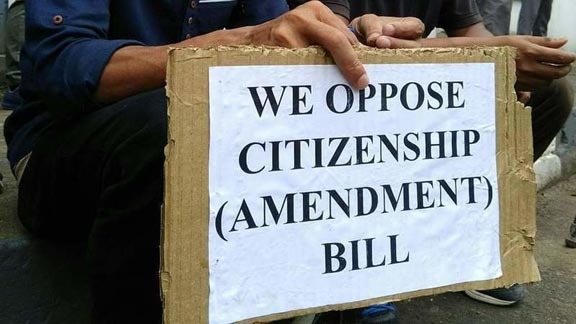 He attended a protest organised by the NGO Coordination Committee in Aizawl against the Citizenship (Amendment) Bill. The NGO Coordination Committee is an umbrella group of civil society and student organizations protesting against the bill, reports The Scroll. The committee’s general secretary, Lalhmachhuana, said the protest was organised against the government on the day the contentious bill was to be tabled in the Rajya Sabha. Congress spokesperson Lallianchhunga said Thanhawla had attended the protest along with his wife. “We will oppose the Bill till the last breath of our life as it is a situation of life and death for the people of Mizoram,” Lallianchhunga said. The Congress party’s unit in Mizoram termed the bill draconian. “The state PCC chief has ordered all shutters down at Mizoram Congress Bhavan and requested all Congress members to participate in the protest,” the party said. The bill seeks to amend a 1955 law to grant citizenship to persecuted Hindus, Buddhists, Sikhs, Jains, Parsis and Christians from the Muslim-majority nations of Bangladesh, Afghanistan and Pakistan if they have lived in India for six years. It has been passed in the Lok Sabha.